There is a small section in the supermarket where they have small pots of herbs that are for sale; I have been eyeing this for quite some time now, but we did not have space in our old place to grow anything. But ever since we have moved here in Johnsonville (Wellington), we now have an area where we can plant gardens, we have flowering plants in one section, and there's even a sun deck where it can generally get warm and this heat gets circulated into the house! The sun deck is also great for plants that may otherwise find it difficult to grow outside and bear the rather strong winds and extreme weather changes. So awhile ago while we were doing our groceries, I headed off for this section and bought a small pot of Basil for NZ$2.45. 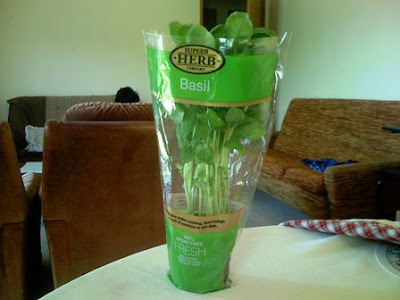 Basil is synonymous to Italian pasta, but it is also great for egg dishes, chicken, and fish. The leaves are usually torn into small pieces and added as the final touch before serving; getting the basil cooked loses much of its flavour. 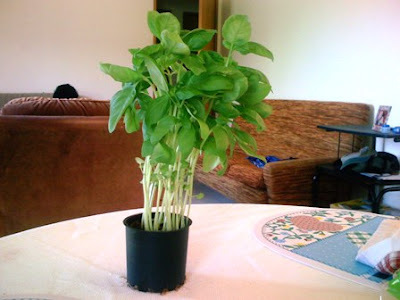 So this Basil will remain indoors; I will be looking for a bigger pot to plant it in, and hopefully it will appreciate the change. I expect this herb to be joined by other herbs in the following weekends. Super Herb Company - they hatched the idea of selling herbs on pots. Great idea, mates! You have a herb garden? That's really nice! I used to have potted herbs in Baguio... hopefully they are all still ok.